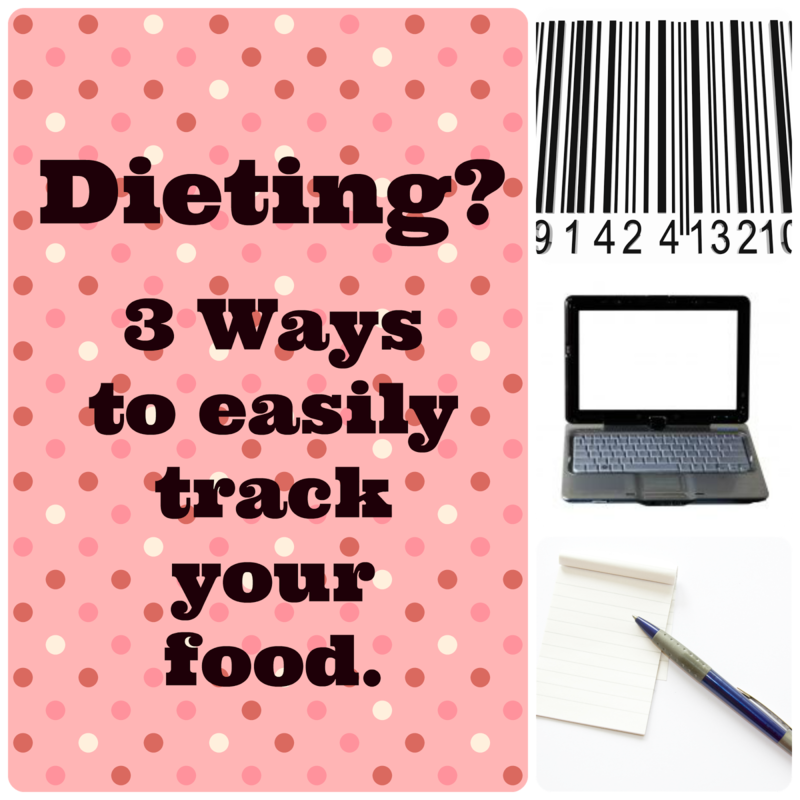 Food tracking is one the essential things to do when dieting. It shows you calories in and if you track exercise you can see calories out. If your calories out is higher than your calories in you will definitely lose weight. It's that simple! A lot people don't like to track food because it can be very tedious. Dieters tend to guess how much they are eating. Without a true count you can easily go over your calorie intake by the hundreds. Do this everyday and you will probably not lose any weight, or worse, gain weight! 1. The fastest and easiest for me is the bar code scanner on a smartphone. There are apps that allow you to scan bar codes on food packages and track what you eat. I have used the SparkPeople App and the FitnessPal app. Though I like the FitnessPal app slightly better, I use the Sparkpeople App because my numbers are updated automatically into my SparkPeople account. SparkPeople is $3.99 and FitnessPal is free. 2. Using a site like SparkPeople. You just go to the food tracking section of your account and search for what you ate and a whole list of similar items pop up. You pick the ones you ate, pick the serving size and add it to your daily food log. The site then calculates and adds everything together. At the end of the day you see your total calorie intake. 3. Notebook and pen. Get a notebook and dedicate it to be your food tracker. You can just write down what you ate for the day and then go to a site like calorie count and see how many calories is each piece of food you ate. At the end of the day just add up what you ate. If you have a smartphone I highly recommend number 1. It is a fast and easy way to track your food for the day. If you don't have a smartphone, using a site like SparkPeople can also easily work to track your food. If you track your food for just one week, you will see what you are eating and can adjust your calories in vs calories out to lose some weight. You may also discover that you are eating too little and need to adjust that too. I agree, tracking is SO important. I also use SparkPeople... the site and the app depending on what I'm up to at the moment. :) The paid app was almost a deal-breaker for me, but I managed to get it for free when it was Amazon free app of the day sometime last year. I do wish they'd better integrate the scanner, though... MyFitnessPal's is way better and I use that feature a lot. I use MyFitnessPal. When I was working out, I thought I was eating great! When I finally got around to tracking it I realized I was eating more calories then I should! Tracking our progress is an important part of a good diet program. Plus it helps us see how far we've come with our goals. Wow - I had no idea you could scan the barcodes on packages and have their information automatically go to a tracking app to manage your diet! Brilliant! It's amazing how much technology can help us in so many parts of our lives. Thanks, Michelle! Great Tips I Like The Scan The Bar Code Idea!! Super tips--would be MOST HELPFUL!!! I have never heard of Calorie Count. I am going to check it out. My Fitness Pal is another good app to track calories and activity. I joined SparkPeople years ago, but I do like the sound of that app. Definitely going to check it out! I love the idea of using the apps to scan barcodes! I have a Sparkpeople account that I've been neglecting. I may have to get back to it. I think using these types of apps to count calories is a great idea and helps you realize how many calories different foods contain. But there was a point on my health and fitness journey where I had to stop counting calories because it was becoming a negative for me. I'm a perfectionist and obsessed over it too much. So for me, not counting calories is one of the best choices I've made. Good info! I track using the scanner.. it works great and i am totally digital. These are awesome tools. Thank you for sharing. I agree it is so important to keep track of what you are eating. I usually keep a journal but these ideas are great. I think it's a really good idea to be able to scan barcodes, that makes life easier! I personally do not track my food or count calories. I just try not to keep too much junk food around the house, and have healthy snacks instead (hummus and whole wheat pitas, kale chips, nuts, fresh homemade baked goods, etc.). Thank you for sharing info about this app! I used to use an easy computer program to keep track of my daily food intake, along with their calories and how active I was. I started doing it when I first found out I was having low blood sugar issues and had to make sure I was giving my body enough complex carbs to break down throughout the day to keep my body going. Using that program made it super easy to get me into the habit of getting everything I needed. I agree; a food diary is essential to healthy weight loss! I've lost 35 pounds while using MyFitnessPal. Now I'm using it to ensure I'm getting enough calories and protein to build muscle. I also have mine linked to my RunKeeper app, so my daily runs or walks get uploaded right into MyFitnessPal. It's very handy! My daughter uses My Fitness Pal and loves it! I had never heard of Spark People! Thanks for sharing! I think I'll definitely be checking out the FitnessPal app (since it's FREE) and see how I do! Thanks for the tips on these two really helpful tools! Great tips. I definitely need to try this. Thanks for the info. I have to track to lose any weight! It keeps me honest! I've never used spark people but I might have to try it! Thanks for sharing! The barcode scanner on the smartphone is great. I've used that before to keep track of my protein consumption. sounds like a wonderful resource for diets that you need to track food on. Thank you for sharing! These are all great tips! I'm always looking for ways to track my food. I, unfortunately, do not have a cell phone...let alone a smart phone. However, I highly recommend Calorie Count, as I used to use it daily. i need to track again. i was doing so well at the beginning of the year. This is the first time I have heard of apps available to scan barcodes and track calories. I can see that being very effective to a dieter. Its amazing how far technology has come! I've seen a lot of people using the My Fitness Pal app lately. I don't think I could ever keep track of what I eat though, regardless of an app or not. I track with MFP and notice a HUGE difference when I make sure to track everything! It's not too hard to track if you're not eati g all sorts of crap! It also helps to plan meals beforehand.